GMA's Sawyer Gushes to Iranian President: How Often Do You Cry? Diane Sawyer: "Well, in a minute we're going to talk and I'm going to get the questions you have from e-mails. But a number of people have already said is there anything surprising, personal about President Ahmadinejad that we didn't know? Well, it turns out, someone told me he cries a lot. That he is dramatically sentimental and sympathetic if someone comes up and expresses a personal plight. So I just asked him, are you often in tears?" Mahmoud Ahmadinejad: "Yes, that's true. Not only for Iranians, of course, they are very close to me and I love all Iranians. And anywhere, when I see people suffering, I have the same reaction. And we feel sad for people of Iraq, for the people of Palestine. Anywhere we have war, we feel sad. Even when I see on TV that, for example, some Americans, because of tornadoes or a hurricane, they have lost their homes, I become sad. Because, for us, human beings are respectable, no matter where they are. Human beings are respectable and they have their own dignity. And all of us should help so that people can lead better lives, to live at peace. And to live-- peace and brotherhood. From our religion’s viewpoint of our religion, all people are respectable, and they must be loved, regardless of their nationality, ethnicity, or religion. This is part of our religious teaching, and we'll live with this religion. Thank you." 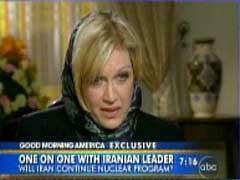 Diane Sawyer: "So, I’m Diane Sawyer again in Iran. You know, you’d think gasoline that costs 40 cents a gallon would just be great, right? That’s until you see the traffic and the smog here in Tehran. So many days the smog is so horrible you couldn’t begin to see those mountains behind me, some of the houses you couldn’t see. Think of it another way, the ancient silk road has become an eight lane highway. Take a look at the traffic in Tehran and despair. This is a country where the cost of a gallon of fuel is less than a bottle of water. It's subsidized, so is air travel, $20 for anywhere in the country. So it's burn the fuel, create the smog, while the economy founders, and why? Some people in Iran want a freer economy, but not the president. And we asked him about 40 percent of the people living below the poverty rate, 11 percent unemployment, inflation, food, skyrocketing." Mahmoud Ahmadinejad: "Well, that's natural. You have it everywhere. In the US also, you have economic problems. You have 45 million people who do not have any insurance. And also, we have the same number of people who are homeless. We have economic problems everywhere. And we should try to solve these problems." So, on Diane Sawyer’s tour of the Middle East, Americans found out that Mahmoud Ahmadinejad cries and that Syrian President Bashar Assad likes his iPod. One can only wonder what queries a return trip to North Korea will yield. Mahmoud Ahmadinejad: " Well, that's natural. You have it everywhere. In the US also, you have economic problems. You have 45 million people who do not have any insurance. And also, we have the same number of people who are homeless. We have economic problems everywhere. And we should try to solve these problems." Sawyer: "Even though, Iranians are an economic explosion waiting to happen. For centuries, one of the world's great trading partners providing the finest pistachios, the tastiest caviar to lands far away. And, of course, nothing more famous than its carpets, handmade in hundreds of small villages and cities throughout the country. Get this, the oldest Persian carpet surviving in the world, 2,500 years old, was found in Siberia, 1500 miles from Iran. Today, Tehran is the center of carpet trading, and we visited Manuchehri (PH), a leading shop to learn how to tell the old carpets from fake old carpets. They feel like velvet mixed with cream. And how to know which are the best new carpets and worth whatever you pay. The material?" Sawyer: "The number of knots." Sawyer: "The pattern, how interesting or complicated. And the colors?" Seller: "Have you heard the saying that most Iranian women are like Iranian carpets? The more they are aged, the beautiful they are." Sawyer: "I believe it. You know what they say about American women?" Seller: "Mm-hmm. I don't know." Sawyer: "Not like carpets. So here they are, a nation ready to sell to the world and a world trapped in Iran's argumentative politics. Even the president seemed plaintive about what was possible." Ahmadinejad: "I wrote a letter to the American government, I mean the aviation sector of our country, and we wanted to salvage direct flights between Tehran and New York, and we want to have free travel of citizens. We do not have any problem with the people. And right now, we have, for example, our scientist and a sportsman traveling to the U.S."
Sawyer: "All that oil revenue flowing away. All that economic energy waiting for a new day. And so, that's the economy and the rug market here in Tehran. When we come back, I'm going to address some of your e-mails. They've been pouring in. What jobs can women not hold, is one of them that one of you has asked. And some of them have been angry, saying, 'Why do you travel and talk to America's enemies?’ We'll be answering these. A real conversation coming up. Stay with us. I'll see you then. From Tehran, we are live."